Join us in touring three countries, Germany, Austria and the Czech Republic, at their best. You will be able to enjoy a combination of some of the most beautiful cities and towns in Europe and particularly in Central Europe, together with pristine nature, river meanders, shaded woodlands, open meadows, beautiful countryside, countless historical monuments and much, much more. You will visit not only the old and famous gem-cities of Munich, Salzburg, Cesky Krumlov and Prague, but also many off the beaten path sites, which are amazing, yet not many tourists get to see them. You will be able to see the similarities as well as differences among these three Central European countries and to experience the real life of people in these areas. Come to see for yourselves…..
10 nights lodging in selected 3-star to 4-star hotels and pensions. Hearty breakfasts every morning and 6 wonderful dinners. Bilingual tour guide and ride leaders on route. Walking tours, including sightseeing in Salzburg, Cesky Krumlov and Prague. Excursion fees to selected castles and chateaux. Today we continue riding along the foothills of the splendid peaks of the Alps, enjoying the beautiful scenery of the Bavarian and Tyrol regions. We cross the border back to Austria. Our destination today is the city of Salzburg, arguably the most beautiful city in Austria. The town is situated among the lush hills that hem the Salzach River, creating a perfect picture of this fairy-tale town, one of the most famous cultural destinations in Europe. The city’s splendidly preserved “Old Town” is one of the Continent’s baroque gems. Salzburg is a host to many cultural festivals and is famous, among others, for its classical music scene. It is also the birthplace of Mozart. We stay in our hotel in Salzburg one more day. You have a couple of options for today. You can take a day off and stay in the city, enjoying its many attractions, taking a tour of the downtown and visiting some of its many museums and the birthplace of Mozart. Or you can hop on the bike again and join us for a relatively short ride to the world’s most famous salt mines in Hallein and/or the village of Berchtesgaden, which played such a big role during the days of the notorious Third Reich. It was here where Adolf Hitler had his Berghof residence. These days there is a restaurant overlooking the Bavarian Alps, where you can enjoy a meal or a drink. In Hallein, we can book a tour of the mines for you. We should be back in Salzburg just in time for dinner. We head in the northwest direction today, away from the Alps, passing charming Austrian towns and villages. The area north of Salzburg is known for its many lakes, diverse forests and pristine nature. 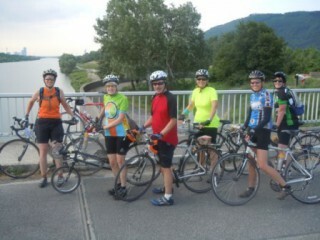 We cross the border back to Germany and keep riding through traditional Bavarian towns and villages. Our destination today is Landau an der Isar, a town founded in 1224 on the bank of the Isar River, which adds to the beauty of the city. This is the longest stage of our trip and our van will be available for some shuttles to make the distance a little bit shorter. After breakfast, our trip is officially over. If you can, you should definitely extend your stay here for a few extra days to explore the city in more depth. For full enjoyment of the trip, you should come prepared to complete the 60-95 km / 40-60 mile days comfortably on rolling to moderately hilly terrain. We try to design our route along small, quiet, and picturesque roads with little car traffic and/or bike paths that enhance our sightseeing of the local areas. For the most part road surfaces will be of very good or good quality, however we are to expect small sections, where the road is not as well maintained. We suggest a road or touring bike equipped with 23-28mm tires for this tour. Munich is serviced by Flughafen München Airport located about 20 km northeast of the city center. There is a public train service from the airport to the city center (approximately a 45-munite ride). Alternatively, taxi service is widely available as well. Prague is serviced by Vaclav Havel Airport, located just west of the city center. There is both public transportation and reasonably priced shuttle service available from Prague to the airport to. Your rental bike comes with a rear luggage rack, bungie cord, extra tube and levers, water bottle cage, pump, lock, and odometer. The price for renting a bike for this tour is $200 for Fuji Absolute or $270 for Fuji Newest or Fuji Roubaix.